BIRD is an acronym for Israel-U.S. Binational Industrial Research and Development. 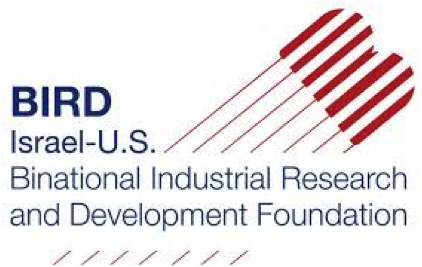 The BIRD Foundation’s mission is to stimulate, promote and support industrial R&D of mutual benefit to the U.S. and Israel. Their activities include matchmaking services between Israeli and American companies in the field of Research and Development. BIRD takes no equity in the joint projects and all our services are free of charge. The BIRD Foundation was established by the U.S. and Israeli governments in 1977 to generate mutually beneficial cooperation between the private sectors of the U.S. and Israeli high tech industries, including start-ups and established organizations. BIRD provides both matchmaking services between U.S. and Israeli companies, as well as funding covering up to 50 percent of project development and product commercialization. Any pair of companies, one Israeli and one U.S.-based, may apply jointly so long as they can demonstrate the combined capabilities and infrastructure to define, develop, manufacture, sell and support an innovative product based on industrial R&D. The key criterion is that each corporate entity shall have the ability to carry out its part of the joint development and commercialization. Their willingness to share in the financial risk of product development as well as in the financial gain of commercialization, are also key factors in BIRD’s evaluation. Many states have recognized the opportunity for realizing significant benefits by seeking to increase trade with Israel. Utah is one of 33 states that have cooperative agreements with Israel. Funding for such projects and the adoption of Israeli technology is available from the Binational Industrial Research and Development Foundation (BIRD). BIRD funds projects in 36 states including Utah. Ron Zamir, of AllenComm is a recipient of such funding which had seen AllenComm grow from strength to strength and further relations with Utah and Israel. The United States and Israel established BIRD in 1977 to help fund joint U.S.-Israeli development and subsequent commercialization of innovative, nondefense technological products from which both the Israeli and American companies can expect to derive benefits from. Most grant recipients are small businesses involved with software, instrumentation, communications, medical devices, and semiconductors. BIRD has funded more than 800 joint high-tech R&D projects through conditional grants totaling more than $210 million. Products developed from these ventures have generated more than $8 billion in direct and indirect revenues for both countries and has helped to create an estimated 20,000 American jobs. BIRD is a strong pillar of US-Israel industrial cooperation and that the extreme success of BIRD has led Israel to adopt similar models of R&D with other countries. The Utah Israel Economic Council is a 501(c)(3) organization incorporated in the state of Utah. Copyright © 2015 Utah Israel Economic Council. All rights reserved.